GALION — At the 2018 Crawford County Fair, many visitors will enjoy food, entertainment, animals, and exhibits throughout the week-long schedule of events. But for the McKibben family and many others involved in 4H, fair week is a showcase of the work they have put into animals and projects practically year round. Each of the McKibben children have been involved with 4H since they were in third grade. For the oldest, 15 year old son Mason, this is his eighth year participating. His entry this year is a self-determined project on Climate change, and will also be doing a demonstration alongside younger sister Lynae. Mason is also a 4H camp counselor and Junior Fair Board member. In taking on a self-determined project, Mason took a more challenging path for his project. Members of 4H generally get a selection of topics to choose from and are then guided through their project with a book relating to their topic. This was not the case for Mason, who had to build his Climate Change project on his own based on his previous experiences. “There are around ten other self determined projects and I will get judged in the same group,” said Mason. Thirteen year old son Nolan is in his sixth year of showing a horse at the Crawford County Fair. This year will be his first time with new horse Sassy. Nolan is also entering a cooking project, which earned him a place at the Ohio State Fair the past two years. Twelve year old twin sisters Ayla and Lynae round out the 4H involvement for the McKibbens. Ayla chose to do her project this year on scrap-booking, and will also be doing a lava lamp demonstration with her cousin Brynn. Lynae has raised two hogs, Max and Erma, that she will be showing at the fair this year prior to selling them to go to market. While training and walking her hogs every day is a commitment, Lynae admitted that selling them once the fair is over is the hardest part. Having her children involved in 4H was practically a given for mom Krista (Nigh) McKibben. She and all of her sisters were heavily involved in 4H as youngsters themselves. Krista and her husband Brad, both graduates of Colonel Crawford High School, dedicate much of their time to supporting the kids at every level of involvement. Just like most 4H families, it is an investment for the whole family. Krista is very quick to praise the benefits that come as a result of participating in 4H. “In their early years, the kids were led by Brad and I when they did anything. Now they do their chores on their own, they know their responsibilities, and we can trust that they are doing things like they are supposed to be done,” said Krista.Mason, Lynae, and Ayla are members of the Dairy Maids and Gents 4H club which is led by Karen Hudson along with a large number of others who help and specialize in different aspects of the group. While the McKibben children attend school at Colonel Crawford, Dairy Maids and Gents has members from many schools all over Crawford county. Nolan is a member of the Young Riders Club which primarily focuses on horses. 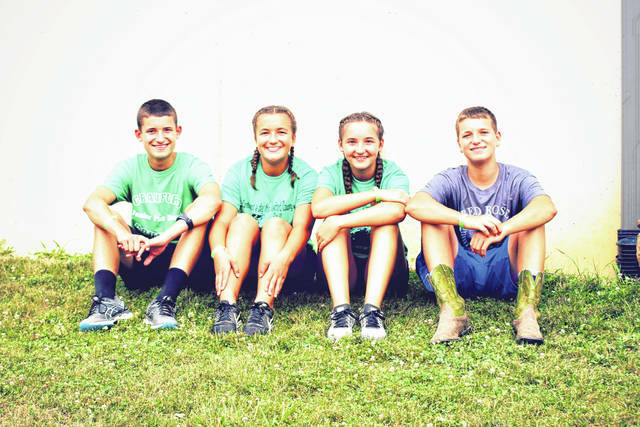 Erin Miller | Galion Inquirer Mason, Ayla, Lynae, and Nolan McKibben are just one group of siblings and families that will be heavily involved in a variety of events this week at the 2018 Crawford County Fair. https://www.galioninquirer.com/wp-content/uploads/sites/38/2018/07/web1_IMG_7098.jpgErin Miller | Galion Inquirer Mason, Ayla, Lynae, and Nolan McKibben are just one group of siblings and families that will be heavily involved in a variety of events this week at the 2018 Crawford County Fair.